The countdown has begun with only 10 days left until Vivid Sydney launches and transforms Sydney into a wonderland of illuminations, lighting sculptures, laser shows, huge projections and art-innovative light installations for everybody to enjoy – for free. Vivid Sydney starts on Friday 25 May and continues through to Saturday 16 June 2018 for 23 days. The lights will go on from 6pm – 11pm every evening. It’s the most long-awaited annual event that attracts millions of visitors from all over Australia and overseas. With over 10 locations, and 3 weeks of Vivid Sydney to enjoy… there is lots to see and do. With our own experience of Vivid over the years combined with research, we have put together this article to help families make the most of this incredible event. Vivid Sydney is a unique annual event that happens in Sydney at various locations and it is back for it’s 10th year. Returning from 25 May to 16 June 2018, Vivid Sydney is a festival of lights, music and ideas that transforms Sydney into an amazing wonderland of lights, colours and music. What you will see is a spectacular light show and projections on some of Sydney’s famous buildings and iconic structures such as the Sydney Opera House. This is the biggest attraction during the Vivid festival. Streets will be lined with lighting sculptures and art-innovative lighting. You really have to see it for yourself to truly appreciate it. Vivid Sydney 2018 returns to Sydney for 23 nights from Friday 25 May to Saturday 16 June 2018. The best time to visit would be on a weekday, especially if you are travelling with kids. I speak from experience when i say this as we have been on a weekend a coupe of times with both times being too overcrowded. We had one bad experience in 2014, it was a Sunday. We got the train to Circular Quay and the nightmare began. The station was jam packed and overcrowded that we were literally having to walk with our heads down to avoid stepping on anyone’s feet. Once we finally got out it was so crowded that we couldn’t even see where we were going and at the pace we were walking it felt like we were never going to reach the Opera House. Then the most embarrassing thing happened…me and my girls lost my husband, and with no phone, no money (because hubby had the bag carrying them) to get in touch, i was left with no choice but to ask a stranger if i could borrow their phone to call him. Thanks to this lovely person i was reunited. We decided at that point we had had enough. It was over crowded we really couldn’t do much and without seeing anything we decided to go back home. Never again! From that time we have always visited on a weekday and its been much better and more relaxed. It’s also best to leave early. Sunset is around 5pm in Sydney and the lights switch on at 6pm at most places apart from Toronga Zoo and Chatswood where they start at 5:30. Try and leave by late afternoon with the kids, that way you will avoid the peak hour rush, be more relaxed and be there on time to see the lights turn on which the kids will be really excited about. There are many different vivid locations to check out that you will probably have to go again. Starting on Friday 25 May to Saturday 16 June 2018, Vivid Sydney will be hosting a huge range of events that will either be free or ones you need to pay to see. The best part is that all the best family friends precincts and Installations for Kids are FREE. OK so this looks like something out of the E.T. Movie. Not sure if the smaller kids will get afraid but the older ones might find it rather fascinating when they see the giant luminescent creature, wandering along the waterfront in a highly theatrical display of sound and light. This years theme at Barangaroo is inspired by water, earth and fire. The lights will turn on at 6pm and Barangaroo’s waterfront will be lit up. How to get here: Catch a train to Wynyard station and use the new Wynyard Walk direct to Barangaroo. I love Chatswood and I’ve always found it to be a great place to take the Kids. Its easily accessible by public transport and car and easy to navigate around with lots of places to shop and eat. How to get here: Chatswood is accessible by public transport with frequent services or you can go by car and park at Westfield Mall. Parking is Free for the first 3 hours. This year at Chatswood there will be 12 events and installations around Chatswood Precinct. Here are our 7 top picks that is sure to be a favourite with the kids. Crank Zappa Jellyfish is a hot tempered electric jellyfish who will zap you with his fiery tentacles if you get too close. Crank is coming to Chatswood and will help teach the kids about plastic and the harm its doing to the environment and what changes we can make to help the environment by reducing plastic consumption. Crank Zappa jellyfish has been constructed using only plastic items. A market that’s been set up on the main precinct of Chatswood, inspired by the incredible and complex architecture of shanty towns. The light market is dazzling and inviting with cuisines from all around the world, kids friendly installations and the junkyard beats that has been built from recycled materials. Oh… and let me not forget to mention the stall selling ‘squishies’…It’s the new kids craze at the moment. Do your kids love astrology? Taking centre stage at Chatswood this year, the Concourse performing arts centre will once again have spectacular projections on it’s sails and stairs with this years theme being space, exploring the solar system. Find a spot to sit on the grassed area and enjoy the display as you embark on a journey through space. Do your kids love playing the drums? Then head on down to see The Octopoda at Westfield entrance in Chatswood mall. Under each of the eight tentacles is a connected drum and each time the drum is played a really unique display of light and colour shoots out of it tentacles and illuminates Octopoda. The Skyportal begins at the Chatswood Interchange where you and the kids will be transported to some other place through an interactive video experience. As you leave the interchange, look up and you will see a giant screen hanging 10 metres above your head. You will be able to see yourself in the reflection in some other time and place. Swim in the Barrier Reef, wander among icebergs, walk along a dry river bed or negotiate a wetland. Take a ride on the Magic Carpet and be part of an exciting interactive image. You can choose to sit, lay or stand on the carpet and become immersed in another world which you have total control over simply by moving around on the carpet and doing the actions to match what is on the screen, things like swimming with fish, bouncing with the bubbles. This activity is suitable for all ages. Liquid Lies will be set up within the Light Market in Chatswood Mall and it will be Managed by a crazy professor. You will be hooked up to a lie detector and asked three easy questions. The lie detector will determine if it’s a lie or your actually telling the truth and based on your answer will deliver a flavoured drink accordingly. Will you end up with a sweet treat or sour slush? This may sound crazy but the benches in the mall will come to life. You can actually have a conversation with a chair! How it works is you need to sit on the bench to activate a sensor and that’s it – the bench will start talking. By far the most visited place during Vivid Sydney with be the Sydney Opera House. You will find a sea of people gathered along the water’s edge down the eastern end of the Quay. This is the spot to have your best photos taken of the iconic Harbour Bridge, Sydney Opera House and Luna Park in the background. They will be created by Australian artist and designer Jonathan Zawada that will transform the Sydney Opera House sails into a series of 3D digital sculptures that will look like they are sitting inside of the sails, rather than on the surface. How to get here: Catch a ferry or train to Circular Quay. 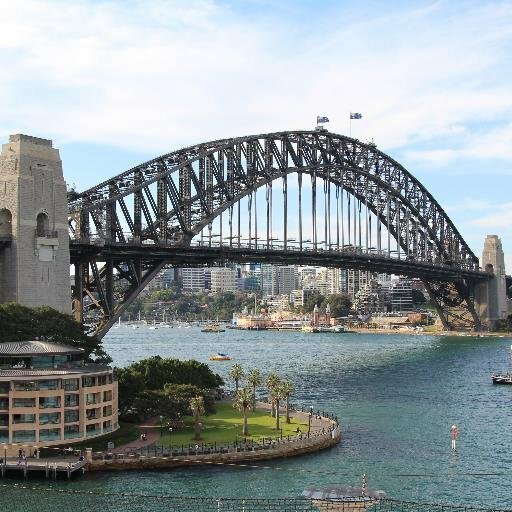 It is approx 5-10 minute walk to the Opera House from the train station or ferry terminal. Crowd control was certainly in place on Friday for the start of Vivid. We were down at Circular Quay to see the launch and It was truly spectacular. If you want to go down to Circular Quay and avoid the crowds you might want to go earlier in the week and take public transport. We’ve created this video so we could share some insights of our lovely evening on Friday with you. Sydney’s skyline will come to life with its massive display of lighting and laser beams stretching from the Sydney Harbour Bridge and Circular Quay skyscrapers to the outer areas of Sydney Harbour. This year, in a first for Vivid Sydney, incorporates a new, fully interactive custom-built laser, double the strength of any laser ever seen before on Sydney Harbour. Snugglepot and Cuddlie pie is a classic Australia kids story book and this year will mark it’s 100 anniversary. These characters were created by the author May Gibbs. You can browse through the tiles of her new and original stories here. In celebration of its 100 year anniversary, projections will be displayed on the Customs House that will take visitors on a journey through the Australian bush with Snugglepot and Cuddlepie. I absolutely love to visit Darling Harbour. I always find during events like these that Darling Harbour never fails to impress, hosting kids friendly activities. There are a great selection of fine dining restaurants and cafes. This year Darling Harbour will experience an ocean theme that will take visitors on an under the water experience with incredible water fountains, light and laser displays. We are really looking forward to see it. Address: Across the Darling Harbour area. How to get here: Darling Harbour can be accessed by walking, catching the ferry or by car. If catching the train into the city, hop off at the Town Hall and walk across to Darling Harbour. One of the highlights of Vivid Sydney at Darling Harbour each year is the fireworks that happen every Friday and Saturday evenings at 8.00 pm from Cockle Bay. This year, Cockle Bay will be transformed into a ‘Fantastic Oceans’ theme – a story from the underwater world. Water features will come to life and resemble jelly fish, corals and deep-sea flora in a fantastic display of colour with lasers ripple like waves of the ocean. This year Tumbalong Park will have 4 child-friendly installations that will form an inclusive and accessible Vivid Lights experience for both children and the young at heart. The theme chosen this year is under-the-sea and allows children and their families to work together with creative, breathtaking light experiences that help develop a sense of belonging and control, while at the same time inspiring fun and playfulness. While in Darling Harbour for this year’s Vivid Sydney, head to the Australian National Maritime Museum. Images from BBC Earth and Sir David Attenborough’s Blue Planet II will be projected on its iconic rooftop. Head to Darling Quarter’s Light Playground and let the kids dance with the colours of the rainbow at the Rainbow Shadow Disco – a lively way to watch your dance moves come alive in colour whilst bopping away to funky tunes. Vivid Sydney is coming to Luna Park for the very first time where the iconic amusement park will come to life with large-scale projection on the façade of Coney Island. The event is being called ‘spirit of fun‘ and celebrates the history, magic, creativity, engineering, fantasy and imagination that have come together to create millions of memories on this unique and special site. This year the Ferris Wheel at Luna Park will be lit for Vivid Sydney following an LED refit, which has included a massive boost in the number of lights adorning the wheel. How to get here: Luna Park Sydney is accessible by Ferry, Train or Bus. Ive never been to Toronga Zoo during the Vivid but it sounds like a great day out with the family during the Vivid festival. Vivid Sydney at Taronga Zoo presents “Be the Light for the Wild”. You will be able to purchase tickets for the show at Taronga Zoo. During your session time you will be taken on a tour around Taronga Zoo displaying amazing Vivid Festival Lights and sculptures that will take you underwater and into the jungle, You will later visit the Taronga Centenary Theatre to behold a multi award-winning animated film, presented here as a 270-degree cinematic experience. How to get here: catch a ferry from Circular Quay to Taronga.There is also parking on site, although this is limited. One of the best spots to visit this year will be First Fleet Park located at The Rocks between the Museum of Contemporary Art Australia and Customs House. This is the perfect place to take the kids to this year. Not only will you be able to enjoy all the kids friendly installations that have been set up around this precinct, you will also witness breathtaking views of Sydney Harbour Bridge, Sydney Opera house and Customs House all of which will be lit up during the Vivid Festival. How to get here: Catch a ferry or train to Circular Quay and it’s a 2 minute walk to First Fleet Park. The Garden of Sweets has been designed in such a clever ‘delicious’ way to teach families and children about how solar panels, luminescent powder and mechanical energy can be used as a source of renewable energy. I said the word ‘delicious’ because the interactions are in the shape and form of sweets, lollipops and striped candy canes…yummy! You would have seen the roly-poly toys that kids play with or they often get inside goody bags after a party right? Well, come and see the huge Wobbelees entice visitors into play with four oversized roly-poly toys that, when pushed or knocked or nudged off centre, return themselves to an upright position. Visitors are invited to push a Wobbelee and watch it wobble from side to side, changing colour each time it tilts, and listen to its soft chiming sounds until it slowly comes to a stop. Come and visit Fugu – a kinetic lighting sculpture in the form of a giant puffer fish, which captivates audiences by expanding and contracting its spiky rotating form. As visitors gather, Fugu comes to life, his swirling body expanding, glowing and pulsating in colours inspired by the sea and the astonishing creatures living beneath its depths. Come and enjoy the installations at the Royal Botanic Garden Sydney. Aqueous is an interactive landscape of twisty and bendy pathways of light. The light and colour changes based on human movement as you run and walk along the pathway. How to get here: Catch a ferry or train to Circular Quay. It is approx 5-10 minute walk to the Royal Botanic Garden from the train station or ferry terminal. The Harbour Lights will be turned on at Vivid Sydney that will create this spectacular lighting display on the Harbour. Ferrys will be decorated with wonderful LED lighting with colours changing simultaneously. Many cruise companies set up packages during this time and take their guests on boat cruises past the main sights of the Vivid light festival.Some would say that this is the best way to see the lights but then others would argue it’s too expensive and why bother when you can take the public ferry instead. Your paying far less and you see the same sights. For the best cruise deals your best to buy them from deal websites such as Scoopon and Groupon. You will find many deals that offer complementary drink on arrivals or other deals with with wine and buffet included. Harbour Lights with vessels moving across the water in a synchronised lighting display. It is starting to get cold in Sydney so you do want to be prepared during the Vivid Sydney. Pack jumpers / coats as the evenings in Sydney get chilly especially more in CBD near the harbour. Pack lots of snacks and water too. It will also save you time and money. In the evenings it might be hard to get to a food place in the city or there could even be long queues especially at the more popular restaurants like McDonalds, Hungry Jacks and Subway. If you’re travelling with babies or toddlers then take a baby carrier if you have one instead of the pram. It will make it much easier to move around and get on and off public transport. Vivid Sydney begins at the end of autumn and runs into the first couple of weeks of winter. Be prepared and wrap up warm. Even if it’s nice and warm during the day, evenings the temperature can drop rapidly and get really cold, especially near the harbourside. Check the forecast before you leave. If there is chance of rain, take an umbrella or better still a rain jacket or poncho. An umbrella can be a bit of an inconvenience when you’re trying to see everything and take photos. The best way to get to Vivid Sydney is to catch public transport. There will be extra services running during the event and every year new procedures are put into place to help ease congestion on public transport. You should consider options like catching the Parramatta River Ferry that travels all the way up Parramatta River to Circular Quay and returning via train or bus. If this is your first time in Sydney then this is good way a see the great sights of Sydney offering you the best views of Sydney Opera House, Harbour Bridge and CBD Skyline. 1. If you can, avoid going to Vivid Sydney on a Friday and during the weekend. From past experience I’ve found it too crowded. 2. Stay together as a family. The Vivid Sydney attracts millions of people every year so it can get crowed around the main precincts quite quickly. It’s happened to me when we lost my husband and had no way of contacting him as he had my phone, keys, wallet everything. Lesson I’ve learned – always carry your phone on you and tell the kids to carry theirs if they have one. Make sure they have mum and dads number just incase. It’s better to be safe than sorry. 3. Avoid going on the last weekend of Vivid Sydney. That’s the time it will be most busy. 4. If you have to visit during the weekend don’t get on a train at Circular Quay. It’s going to be crazy with queues everywhere. Your nearest train station is Town Hall and is a 15-20 minute walk. 5. Wear Comfy closed in shoes you will be doing lots of walking. 6. Pack food and water and try to have dinner before you leave. Finding a place to eat at night during the Vivid can be a challenge especially with kids and their favourite restaurants like McDonald’s and Hungry Jacks will have people queuing outside the door. It’s not worth it. Save time and money and bring your own. 7. If you have babies or toddlers consider carrying a baby carrier instead of taking the pram. It will make it much easier to get around and you will have your hands free to take great photos. It’s going to be the busiest time around Sydney CBD and because Vivid Sydney is such a popular event there are going to be widespread road closures in place around the Sydney CBD, The Rocks and Walsh Bay areas to help reduce traffic congestion and keep pedestrians safe. It is strongly advised not to take the car to Vivid Sydney and instead use the public transport. There will be extra trains and buses running during the event. Destination NSW’s websites: www.visitnsw.com and www.sydney.com can help you find the accommodation to suit your budget and family’s needs. You will also find information about other events happening in Sydney for you to enjoy during your stay. Vivid Sydney with kids can be an exciting time with lots to explore and discover. Plan your trip carefully and most importantly have fun! Do you have any tips for our readers? Perhaps you have visited places that you would like to recommend. You can leave a comment below. We always love to hear from our readers.